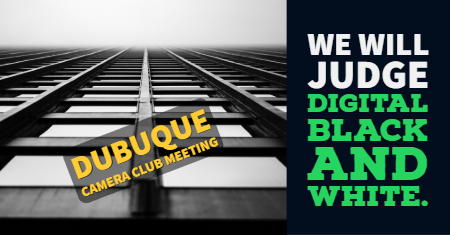 The Dubuque Camera Club meeting on February 4, 2019 was attended by 21 people. Club president Ronald Tigges shared final numbers from the Blufftops & Visions convention that we hosted here in Dubuque in September 2018. Blufftops & Visions was attended by 130 people from 11 states. One-third of the registrations were digital transactions. Our club pioneered the use of online registrations for the annual N4C convention. The three most popular events were opening night (attended by 73 people), the Millwork & Models photo shoot (70 participants), and the American Lady river cruise (78 participants). After remitting the required 25% of the financial proceeds from Blufftops & Visions to the N4C board, we have a positive bank balance to potentially spend on something that club members would like to see, try, or do. Bring in a speaker. For instance, bring back one of the keynote speakers from Blufftops & Visions to lead a night photo shoot this summer. Horseshoe Mound was suggested as a potential location. We would need to collaborate with JDCF. Purchase photography equipment that can be shared between club members. An image sensor cleaner was suggested. Other ideas…? If you have thoughts on these ideas or other suggestions for the use of club funds, contact Ron or bring it up at a future meeting. As the highlight of the evening, Dubuque Camera Club member Robert Felderman of General Bob Photography gave a recap of this year’s national PPA convention, Imaging USA, which he and his wife, Nancy, attended in Atlanta in January. It was a massive event, with over 10,000 attendees, over 2,000 trade show booths, and countless classes and workshops. Photo critiques, awards programs, and parties with endless buffets! General Bob shared a slideshow of smartphone pictures that he captured in the trade show area, or during the convention. Much information at Imaging USA was pertinent to the business side of photography. Hot trends in the world of professional photography include flat studio lighting and mirrorless cameras. Metal and acrylic prints are also popular. The badges worn by convention participants showed their areas of expertise, and some individual wore badges that almost reached the floor! Noteworthy photographers that were present included Peter Hurley, who gives classes for KelbyOne, and who was at the convention to present for Canon. In addition to the scheduled classes, there were many impromptu photography presentations or equipment demonstrations at the vendor booths. Trade show vendors included Canon Professional Services (CPS), Tamron, American Color Imaging (ACI) from Cedar Falls, Iowa, and many more. There were wares for sale from vendors who specialize in printing or display, backdrops, studio equipment, or other photography-related areas. Lots of eye candy from a couple of international photo contests. One software maker claimed to have the secret to fix any blurry image. And the line to purchase gear for taking baby pictures was extremely long! In January 2020 the national PPA convention will be held in Nashville, Tennessee. Convention registration (in the $300 range) is free if you are a PPA member. 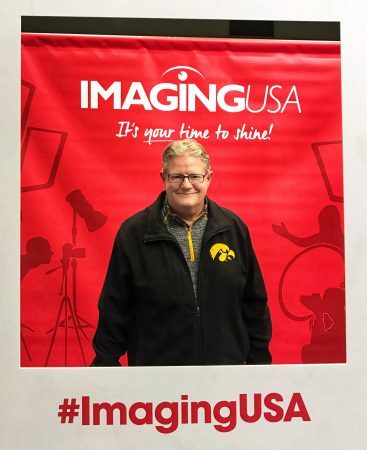 Thank you, General Bob, for this outstanding outbrief of Imaging USA! At tonight’s club meeting, we also went over returns from the January 2019 N4C competition. Our club took home several merit awards and honorable mentions. Congratulations to the following photographers! Our club will judge the Digital Black and White category of the N4C competition at the next meeting on Monday, February 18 at 6:30 p.m. Three experienced club members will be needed as judges. You should have been a club member for at least 6 months to volunteer as a judge. “It is a night where we get to look at a LOT of pictures. I always think it’s a pretty fun night.” — John L.
Black and White photos are judged on the basis of Technique, Composition, and Interest. Audience members will have a lot of images to look at, so be sure to attend! See the N4C Winners Galleries for past winners in the Black and White category. “It’s so helpful to come and watch this, and the photos are amazing.” — Casey K.
Photography by Dubuque Camera Club member Jose Garcia was recently featured on the official Instagram account of Canon USA.